A professor in the College of Arts and Sciences is being recognized by the State University of New York (SUNY) for his contributions to medical science. 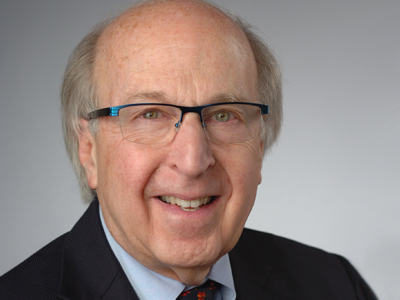 Samuel Gorovitz, professor of philosophy and former dean of Arts and Sciences, will receive an honorary doctor of science degree from SUNY, and will address students at Upstate Medical University’s 2016 Commencement on Sunday, May 22, at the Oncenter Complex in Syracuse. Gorovitz joins Delos M. Cosgrove, president and CEO of the Cleveland Clinic, as SUNY’s 2016 honorary degree recipients. Gorovitz’s work resides primarily at the nexus of science and philosophy. He is highly regarded for his expertise in an array of areas: death and dying, medical fallibility, captive populations, equity and distribution of health care, the tension between business and the practice of medicine, surrogate motherhood, the procurement and allocation of organs in transplantation, artificial hearts, gene engineering and therapy, organ sales, informed consent, suicide, human subjects and the limits of regulation. Gorovitz is the author or editor of eight books, whose titles reflect his wide-ranging interests. They include “Philosophical Analysis: An Introduction to Its Languages and Techniques” (Random House); “Freedom and Order in the University” (Case Western Reserve University Press); “Doctors’ Dilemmas: Moral Conflict and Medical Care” (Macmillan); and “Drawing the Line: Life, Death, and Ethical Choices in an American Hospital” (Oxford University Press). He also has published more than 130 scholarly articles, reviews and chapters. A dynamic and thoughtful speaker, Gorovitz has delivered more than 200 presentations on five continents, and has participated as a consultant or an advisor to dozens of organizations. They have ranged from colleges and universities (Georgetown University, the University of Florida and the University of Pittsburgh), to government agencies (the National Science Foundation, the National Endowment for the Humanities, and the National Institutes of Health), to nonprofits (the World Health Organization, the Woodrow Wilson Foundation and the Florida Justice Association). He also has been invited to provide testimony to the U.S. Department of Health and Human Services; the Presidential Commission for the Study of Ethical Problems in Medicine and Biomedical and Behavioral Research; House Committee on Science and Technology; and the NIH’s Human Fetal Tissue Transplantation Research Panel. That Gorovitz is a long-time member of the New York State Task Force on Life and the Law and the Empire State Stem Cell Board is indicative of his devotion to professional service and his interest in biomedical ethics—a relatively new field drawing on elements of medicine, nursing, the health professions and biomedical research. Another giant in the field is Peggy Battin, who has devoted much of her career to defending the rights of terminally ill individuals. She credits Gorovitz, along with a “few other iconic figures,” for playing an important role in the birth of bioethics. “It was Sam who organized the famous ‘Camp Gorovitz,’ with a savvy group of colleagues, that brought philosophers and others into this emerging field. His group had put together the first anthology in bioethics, long before there was any such field,” says Battin, adding that the manuscript was rejected by dozens of publishers because nobody taught bioethics. The anthology in question, “Moral Problems in Medicine,” was eventually picked up in 1976 by Prentice Hall, which, coincidentally, was among the first publishers originally to pass on it. (“Sam knows when reasoning is standing on its head,” she says.) Forty years and several editions later, the book is required reading for anyone interested in ethics or medical science. Probably no one at Syracuse more appreciates Gorovitz’s aptitude for critical thinking than Arts and Sciences Dean Emerita Cathryn Newton. For the past decade, she has co-taught with him “Linked Lenses: Science, Philosophy and the Pursuit of Knowledge” in the Renée Crown University Honors Program, of which he was founding director from 2004-2010. Lynn Cleary, professor of medicine and vice president of academic affairs at Upstate, prepared Gorovitz’s nomination material that was submitted to SUNY, on behalf of the faculty nominating committee. She says that, while his curriculum vitae provides ample evidence of his scholarship, expertise and wise counsel, it cannot do justice to his “infectious enthusiasm” for the intellectual pursuits of the academy. Such an approach has landed Gorovitz many media appearances, including ones on NPR’s “All Things Considered,” “Larry King Live” and WFMT’s “The Studs Terkel Program.” He also has been quoted in The New York Times, The New Yorker, Ladies’ Home Journal, and other magazines and newspapers. With a career spanning more than 50 years of teaching, Gorovitz began his Syracuse tenure in 1986 as dean of Arts and Sciences and professor of philosophy. Since then, he has held other responsibilities at the University, including teaching a course for three years in the Department of Public Administration and International Affairs in the Maxwell School of Citizenship and Public Affairs and co-directing with Newton the Interface of Humanities and Science/Technology research cluster of the Central New York Humanities Corridor. Arthur Caplan, the Drs. William F. and Virginia Connolly Mitty Professor of Bioethics at New York University Langone Medical Center, worked with Gorovitz and Newton during their joint tenure at the Humanities Corridor. Caplan says Gorovitz’s influence has been felt throughout New York State in education, medicine and public affairs. While at Syracuse, Gorovitz has held visiting appointments at the University of California, Berkeley, and at Yale, Cornell and Cleveland State universities. From 2001-2004, he was the Dearing-Daly Professor of Bioethics and Humanities at Upstate, where he served as an informal advisor and consultant to the CBH, and taught in the College of Medicine and in various graduate education programs. Gorovitz’s academic career includes various positions at the University of Maryland at College Park, the Beth Israel Deaconess Medical Center in Boston, the National Center for Health Services Research, the Council for Philosophical Studies, Case Western Reserve University and Wayne State University. He earned a B.S. from M.I.T. in 1960 and a Ph.D. from Stanford University in 1963. His doctoral dissertation, “Deductive Models for Causal Explanation,” revealed his analytical acumen and foreshadowed much of his life’s work.